Sean Kelly poses with Brian O'Driscoll before their honorary conferral ceremony in The Helix last Wednesday. 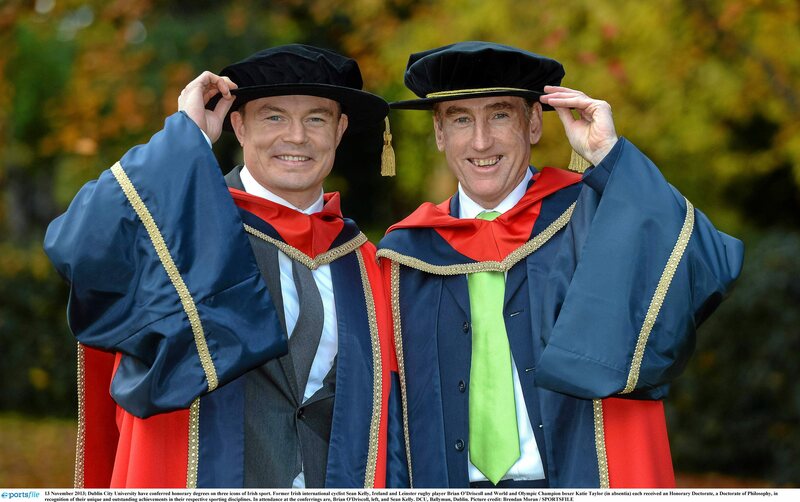 Last week DCU recognised three of Ireland’s greatest sportspeople by awarding honorary doctorates to Brian O’Driscoll, Sean Kelly and Katie Taylor. Both O’Driscoll and Taylor have been lauded over and honoured for quite some time, but Kelly, officially ranked as the eighth most successful cyclist of all time, has perhaps not received the plaudits he deserves. Coming from a farming background in Waterford, he got into cycling at a young age and from there went on to compete in the biggest races the sport has to offer, winning five stages of the Tour de France and winning a total of 193 professional races over the course of his career. Before the honorary conferral ceremony last week, Kelly spoke to the media about his career and how his rural upbringing helped him achieve the success he had always dreamed of. The winner of the 1988 Vuelta a Espana dropped out of education after he finished primary school due to his father becoming ill, meaning he was needed to help out on the farm at home. However, this also allowed him to pursue his passion of cycling. “The sport of cycling is one that you get into at a very early age and, back in those days, people unfortunately dropped their education and went for the sporting career. But looking back now I can at least say that I had a great sporting career”, said the new Dr of Philosophy. After competing at the highest level of one of the most gruelling sports in the world for 18 years, Kelly admits that he was a bit lost once he retired from the sport. The 57-year-old commentates on most of the major cycling races for Eurosport and was doing so at this year’s Tour de France when Dan Martin became the first Irishman to win a stage of the famous race since Stephen Roche in 1992. Kelly says that, after being involved in the sport for such a long time, he found the commentating quite straightforward as he has such knowledge of what the riders are going through. He does admit, however, that he wasn’t quite as comfortable speaking in a media environment when he was out touring himself. Kelly believes that Martin’s success in this year’s Tour de France will be huge for cycling in Ireland and will help inspire more young people to get out on bikes. This explosion in cycling will only be aided as well by the arrival of the Giro D’Italia which starts in Ireland next year, something Kelly is very much looking forward to. actually be quite appropriate to use plastic champagne flutes at a formal event.